Aspen trees can add grace and beauty to home landscapes, providing dappled shade in summer and shimmering yellow fall foliage. The trees seldom die from black leaf diseases, but they lose their aesthetic value. Their unsightly, blackened foliage drops early, slowing the tree's growth, and the leaves never develop their brilliant fall color. Because the fungal diseases are not curable, gardeners rely on prevention to stop them from spreading. 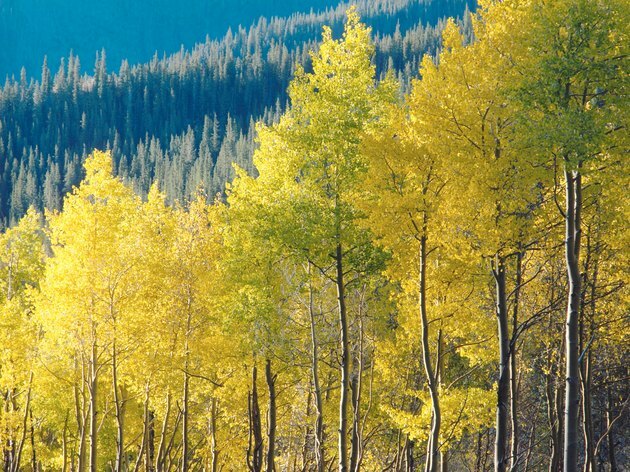 Aspen tree foliage turns bright yellow in autumn. Three kinds of fungi cause black leaf diseases on aspen trees. Diseases caused by Marssonina and Septoria fungi begin as small black spots that grow and eventually join, forming large, black, dead spots on the trees' leaves. The foliage often falls from the affected trees prematurely, and the fungi overwinter in the fallen leaves. Venturia causes a blight that affects the leaves, leaf stems and young shoots. Venturia fungus overwinters in diseased shoots. Wind carries the fungal spores throughout diseased trees and to nearby trees. The best prevention of black leaf diseases in aspen trees is to plant cultivars that resist fungal diseases. You can further reduce the chances of fungal diseases developing by allowing plenty of space between trees so that air can circulate freely and keep the tree leaves dry. Water aspen trees early in the morning to allow plenty of time for their foliage to dry before nightfall. Removing and destroying parts of an aspen that contain spores helps to prevent the spread of fungal disease. Prune off blackened and blighted shoots a few inches below the affected area. Disinfecting the pruners in alcohol or a 10 percent bleach solution between cuts avoids reinfecting the tree. Rake fallen leaves as soon as possible, and destroy them. Cleaning tools with soap and water after working with diseased trees or leaves can prevent infection and reinfection. Fungicides help to prevent the spread of the disease, but they don't cure infected leaves and shoots. If an aspen tree showed signs of disease in the past or nearby trees show signs of infection, spray in early spring before leaves appear. Later in the season, spray as soon as symptoms develop. Copper-based sprays are effective and readily available to home gardeners. Read the product's label, and follow its instructions carefully. The spray must be labeled for use against fungal diseases on aspen trees.